Here are the answers to the questions that have been frequently asked in the past. If your question is not listed, please send us an email or call us. Why should I study Sinology in Göttingen? 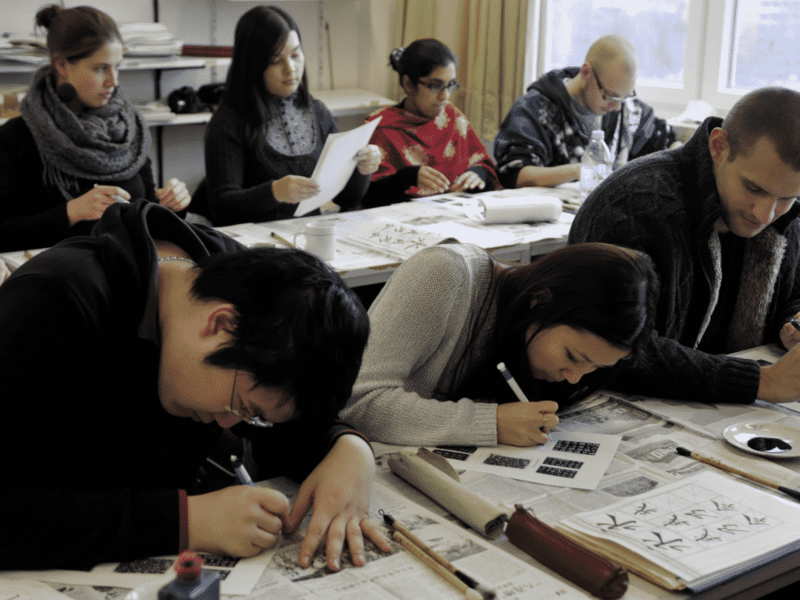 One of the major strengths of Sinology in Göttingen is the excellent language training. The language classes are instructed exclusively by native Chinese speakers and in groups of less than 15 students. In order to consolidate and improve your language skills in a Chinese-language environment, we support you, extensively, with the preparation for your stay abroad. With our long-term partnerships with various renowned universities in Mainland China and Taiwan, as well as the regular evaluations of the learning progress made by our students over there, we provide excellent language trainings for our students. Despite the long tradition of teaching China Studies at the University of Göttingen, the Department of East Asia Studies has been the host institute for significant research and teaching projects which allow us to keep close contact with China. We are equipped with four professorships which offer a wide range of courses on modern China in a thematic basis. We have three Bachelor programs related to China Studies so as to cater for different interests. Studying Sinology in Göttingen leads you to get a degree conferred from a world-renowned university. The Georg-August-University and its related institutes often occupy the top places in national and international university rankings. What are the courses offered at the Department of East Asia Studies? The Department of East Asia Studies offers three Bachelor and two Master’s degree programs: The mono-BA Modern Sinology prepares students for careers in different areas that acquire very good language skills and at the same time specialized knowledge of the development of modern China. The program prepares students with intensive language training and courses of modern China in the fields of history, philosophy, religion, politics, sociology, economics and law. Possible fields of career include, in addition to academic and research work media, foundations, government agencies, NGOs and the private sector. The Double Major BA Modern China Studies offers intensive training on modern China in the fields of history, philosophy, religion, politics, society, economics and law. The program offers an introductory language training in parallel to the good knowledge on development of modern China to prepare students for careers in all the aforementioned fields. With an intensive language training, the Double Major BA Chinese as Foreign Language prepares our students with excellent language skills (Chinese as Foreign Language) or additional didactic communication skills (Teaching Chinese as foreign language) for careers in all areas. These areas include, in addition to translation and interpretation, a teaching career at German schools in Chinese Language. The MA Modern Sinology program provides training for occupations for which profound knowledge of China and excellent language skills are prerequisites. It is to prepare students for an academic career, or to be analysts, counselors and mediators in global institutions, organizations and companies. The MEd Chinese as Foreign Language program qualifies graduates for teaching profession at high schools. You will not only have excellent language skills, but also the educational and didactic communication skills. Which course at the Department of East Asia Studies suits me the best? This depends on your interests and aspirations for the future. The Modern Sinology (Mono-BA) program opens up the opportunity to learn language and the substantial knowledge of modern China at the same time. The Double Major BA programs which focus either on learning and communicating with the language (Chinese as a Foreign Language) or the substantial discussion and the comparative work on Modern China. What are the combinations offered by the Double Major BA Programs? The Double Major BA on Modern China Studies should be led by the profession in which you want to work primarily with. It makes sense to combine this course with a complementing field such as sociology, economic and social history, economics or political science. A list of subjects that can be combined in Double Major BA can be found here. The BA Chinese as Foreign Language program is preparing students for a career as teacher or translator / interpreter. Depending on individual interests and career goals, there are various possible combinations. The choice of the second major in BA Chinese as a Foreign Language (teaching) is set. Click here to see which combinations are possible. After completion of the Double Major BA Chinese as Foreign Language, where can I teach Chinese as a foreign language? The Double Major BA Chinese as Foreign Language qualifies one to teach in both schools or vocational schools. Teacher training is offered for German School / Secondary levels I and II. What are the prerequisite as to apply for the courses at the Department of the East Asia Studies? The BA courses (mono-BA Modern Sinology, Double Major BA Modern China Studies and Double Major BA Chinese as Foreign Language), are not with specific admission prerequisites. The MA programs (MA Contemporary Chinese Studies and MEd Chinese as a Foreign Language) are but with restricted conditions. Where and how can I enroll and apply? Can I enroll at the Department of East Asia Studies with qualification from a technical college? You can also register in our courses with technical college qualification. As a native speaker, can I register directly to the Master of Education (Chinese as Foreign Language)? I have questions about the application process for non-EU foreigners and stateless people. All the relevant information can be found at: http://www.uni-goettingen.de/en/applicants-from-non-eu-states-and-stateless-persons/46866.html. What are the German language skills that are required in order to study at the University of Göttingen? When does the orientation phase start? The orientation phase takes place in the week before the start of the lecture period of the winter semester. You should be noticed when you get your admission. You can also find the schedule on the Internet at www.uni-goettingen.de/philOPhase. What if I notice that I would prefer to attend another course at the Department of East Asia Studies after a few weeks? Switching between the BA Modern Chinese Studies and BA Chinese as a foreign language programs is relatively straightforward because the courses are identical. A change from the BA Modern China in one of the two other China related programs requires a catching-up process for the necessary language skills and hence an extension of your studies. What is the professionalization professional part and which modules should I take? The Professionalisierungsbereich (professional part) comprises 36 C (from a total of 180 C) in modules outside its own program. Individuals can design his/her study according to the options of the bachelor’s program. In addition to the fields of study students can thus further their professional interests or acquire additional qualifications. For this part of study, students can select appropriate modules according to their orientation to their potential career fields. In teacher training, 26 of the 36 C area already reserved for fixed didactic content. The 36 C of professionalization (the professional part) is therefore not to be put together. Instead, you can attain a professional academic profile by choosing a set of modules from one specific subject area. Or you can opt for a profession-related profile to prepare for a career outside academia. What if I do not decide on one particular profile? Students who opt for any of the profiles will be automatically shown as “General Study”. You can choose freely from any events as all subjects are open. Where can I get advice for Professionalisierungsbereich the (professional part)? When should I select my schedule for the first semester? Your timetable should be put together after the orientation phase (O-phase) during the week before the start of the lecture period of the winter semester. In an information session on the last day of the O-phase, lecturers will present themselves and the available courses for the upcoming semester. On this occasion, you can ask questions and make an informed decision about which courses you wish to attend. We also arrange students into small groups for the language courses which will affect your timetable significantly. A course that I want to attend overlaps with another course of my own major. Even if we make sure that the courses at the Department of East Asia Studies are not overlapping with other courses that are intended for your interest, it can always happen that courses are overlapping with other subjects. Unfortunately it is not possible to attend only every second meeting at events with compulsory attendance. You should ask, instead, whether the courses will also be offered in the following semester or year. I started/completed a degree program of Sinology at another university. Are the achievements recognized at the Department of East Asia Studies in Göttingen? Yes, under the condition that your academic record is considered equivalent to what are offered in the Göttingen programs. Please contact the Student Advisors of the Department of East Asian Studies. For an accurate estimation we will need in a full list of the courses you have attended, with the hours per week and the achieved credit points. I already have knowledge on the Chinese language will that be taken into account? If you already have previous knowledge in Chinese language (Mandarin), you should take part in our placement test. To participate in one of the placement tests, please register by 15 September by sending an email to Ms. Ni (lingling.ni@phil.uni-goettingen.de). I am Chinese-native speaker. Do I need to join all the language courses? To get credit transfer for the language modules (Modern Chinese I to V, or basic course Chinese I to IV), you are required to submit (VR China or Taiwan) certificates/proof. This can be certificates of (minimum) middle school (primary stage 初中). If you do not have such certificates, you can take part in a placement test, which will be held by Mrs Ni Lingling, one of the language instructors. If you can provide such certificate, you may also take part in a placement test for the pre-modern literary language (文言文) so as to get credit transfer for the respective module. Can I get credit with my internship? Internships can be counted according to the decision of the Faculty of Philosophy in Professionalisierungsbereich (the professional area). Internship completed up to 12 months before the beginning of your studies can be considered. Please contact the Dean of Studies of the Faculty of Philosophy for consultation. When does the staying abroad take place? In the mono-BA Modern Sinology and the Double Major BA Chinese as a foreign language programs, a mandatory stay abroad in the 5th semester is scheduled. At which university in the PRC and Taiwan (Republic of China) can I do the mandatory staying abroad? The mandatory staying abroad for students of mono-BA Modern Chinese Studies and the Double Major BA Chinese as a foreign language can be held only at the partner universities of the Department of East Asia Studies. They can be found here. As part of the Double Major BA Modern China, can I stay abroad at a university in the PRC or Taiwan (Republic of China)? Yes, but this is not planned in the program and your studies might probably take longer. In order to obtain a place at one of our partner universities without tuition, apply at Göttingen International. When should I plan my semester abroad? You will be invited at the right time (in 3rd term) to an information session of the Department of East Asia Studies, where we provide all the information you need. Can I apply for a scholarship for the stay abroad? Yes. Here you can find more information. Please note that the deadlines for annual scholarships at the foreign university are usually one year before commencement of study! Can I do an internship in my semester abroad? In regular semester abroad in the mono BA Modern Sinology and Double Major BA Chinese as foreign language, you should visit the language courses in one of our partner universities. An internship can take place after the end of the courses, it is possible in afternoon classes after consultation. Should native speakers also spend a semester abroad? No. For native speakers the special terms of the study regulations apply. Do we learn simplified or traditional Chinese characters in Göttingen? In Göttingen you will learn both characters. In the PRC, simplified characters are being used since the 1950s. The beginning of “modern China” was however, much earlier around 1750 when simplified Chinese characters was not used. In Taiwan traditional characters are used exclusively nowadays. How big are the groups in the language courses? The language classes are in groups of less than 15 students. Small groups is an important prerequisite for learning a language. Therefore, apart from the meeting on Monday at 8:15 am, the Chinese language courses are all in small groups. Is prior knowledge expected in the language courses? No. Most of our students have no previous knowledge of the Chinese language. How long does it take until I can read a text in Chinese? To estimate how long it will take for one to learn the characters to be able to read, for example, a newspaper article, is not easy. One should be able to read a simple letter after three semesters, and should be able to understand the newspaper articles after five semesters. What are the books that I need for the language courses? Currently we use the textbooks ‘Integrated Chinese’ in the mono-BA Modern Chinese Studies and the Double Major BA Chinese as Foreign Language. The books for our language courses are purchased in China, so they are at a lower price. You get the information at the information session at the end of the orientation phase. Which level (HSK) will I reach when I finish the Bachelor's degree? In BA Modern Chinese Studies and BA Chinese as Foreign Language, students should reach the HSK level 5. Can I switch to another language course group? You can sign up to a group during the information session at the end of the orientation phase. Subsequent changes is only possible if it is justified after consultation with the respective faculty. Where can I find the valid study regulations for my program? Are there special rules for native speakers? There are some special rules for the students who speak Chinese at an advanced level. In the Double Major BA Chinese as Foreign Language program, native speakers are required to take courses in which the grammar, pronunciation and syntax of Modern Chinese are to be introduced systematically, based on Western concepts. Students who are native speakers should also gain experience in the field of foreign language teaching as tutors. In addition, students who pursue a teaching career should gain experience on subjects of didactics of Chinese as a Foreign Language. Further courses on various topics of modern and premodern China should be completed. For detailed information please refer to the module directory (http://www.uni-goettingen.de/de/315657.html) In BA Chinese as Foreign Language, language courses are reduced but replaced by linguistics and Grammatik-Vermittlung (grammar courses). In BA Modern Chinese Studies and BA Modern China students who are native speakers can take the language courses as alternatives to the content courses to modern China. The mandatory semester abroad in BA Modern Chinese Studies and the BA Chinese as Foreign Language is exempted for students who are native speakers. Are there additional possibilities in Göttingen to learn more about China? The University has always enjoyed having Chinese exchange students from universities of high reputation. With the numerous Chinese students, the Student Council is regularly organizing events such as ‘Round Tables’, festivals celebrations (for example, during Chinese Festivals) and language exchanges so as to offer direct contact with Chinese students. In addition, the Student Council organizes excursions to visit various China-related exhibitions. A China-film series is organised fortnightly in Göttingen, in which selected Chinese movies will be shown and topics discussed such as film directors, actors and temporal reference of the treated subject. 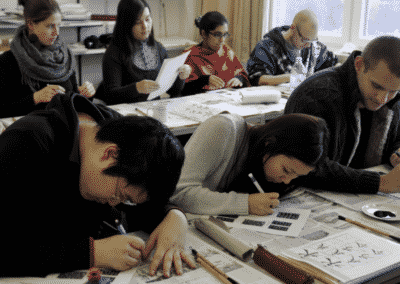 At Göttingen Sinology, are there job opportunities while studying? Each semester certain student assistants at the Department of East Asian Department are hired. It is also possible to apply as student assistants at the partner institutions (for example Intercultural German, German-Chinese Institute of Law).